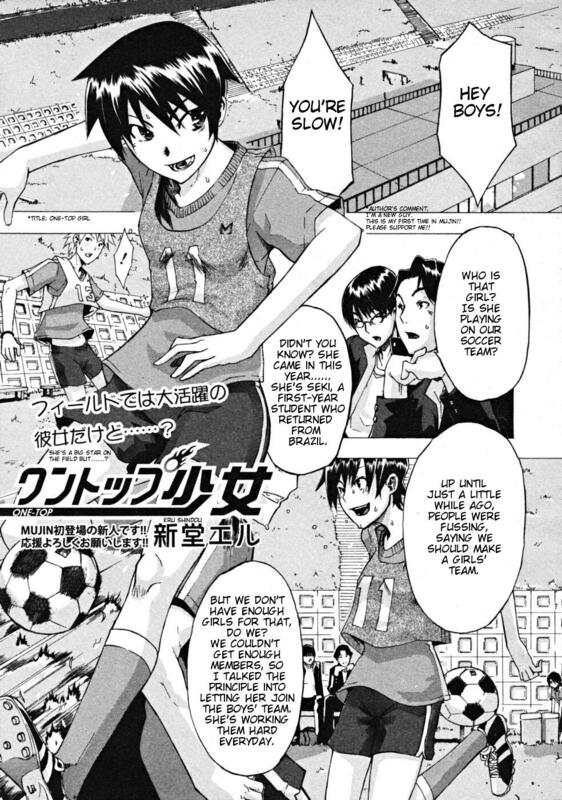 This one is about a soccer girl who plays on the boys’ team. Let’s just say being around all those sweaty boys is driving her crazy. The boys peep on her while she’s doing something in the locker room, and a massive gangbang ensues. This entry was posted on Tuesday, June 23rd, 2009 at 10:28 am and is filed under regular h, Releases. You can follow any responses to this entry through the RSS 2.0 feed. You can leave a response, or trackback from your own site. awesome, keep it up man. thank you. Great artist, superb translation(I learned a lot), and very nice editing. Thank you Brolen, you do fine work. Love the art, are there any other stories with his artist translated or otherwise? There are a few others, they are all translated save for one. The other one, I will be translating shortly, Faytear will be editing it. Names, links or hints at where to get them would be greatly appreciated. DesuDesu has the other two, mind you, they are unusual love stories. Traditional love stories none the less, hope you’re not disappointed? This artist also works as DA HOOTCH, that stuff is really nasty! DesuDesu also has an example of that, if you’re interested. I thought this one was *REALLY* nasty myself. Now I’m intrigued by what he could have possibly done under the moniker of DA HOOTCH. All three at Desuesu’s site, way beyond this one. He works as Shindo Eru to do gentler things, even love stories done very sweetly. I only found barrier free at desudesu tho. If not to much hassel, able to give link to the last on or know what it’s called tried searching using “eru shindo” as search words. as long as the action is steamy and messy the reasons for it aren’t that important, tho there are some I actually read for interesting story.